A fresh bid to hammer out a deal is expected when French President Emmanuel Macron visits India, most likely in December. 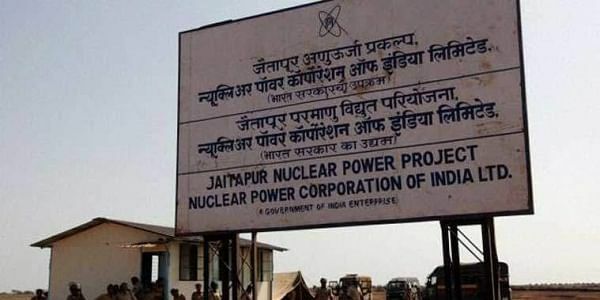 MUMBAI: Ignoring both local protests as well as the fact that French nuclear giant Areva S.A. is facing a financial crisis, the Indian nuclear establishment continues to push for the Jaitapur Nuclear Power Project (JNPP) planned in Ratnagiri, Maharashtra. JNPP, first envisioned in 2009, kick-started with an agreement for two of six third-gen 1,650-MW European Pressurised Reactors (EPR) -- totalling 9,900 MW -- plus supply of nuclear fuel for 25 years. The deal was signed between Areva S.A. and the Nuclear Power Corporation of India Ltd. (NPCIL) in 2010. However, the situation has since altered dramatically. Governments have changed in both countries, Areva S.A. had to be bailed out and now its new owner, Electricite De France (EDF), is reportedly insisting on a hike in per megawatt (MW) cost of around 25 percent from the original quotation of Rs 30 crore per MW. The Pittsburgh-based Westinghouse -- whose technology was bought by Areva S.A., and which was also in deep financial crisis -- filed for bankruptcy earlier this year, sending shockwaves in the global nuclear industry. EDF, which also faces a financial crunch, is pinning its hopes on Macron's forthcoming visit to India to steer JNPP -- which will be the world's largest nuclear power plant when completed -- on to the path of execution. And the government seems keen on getting the project going, despite the fact that, after the 2011 Fukushima disaster in Japan, countries the world over seem to be dumping nuclear power for safer alternatives. "Our continuous negotiations are underway. It's not possible to comment on what could be the revised terms and conditions. We expect everything to be on schedule as originally planned," a top NPCIL official informed IANS in a guarded comment. Despite the stiff opposition from local villagers, farmers and fisherfolk, besides environmentalists, the government of India went ahead with acquiring 968 hectares of land, constructing a boundary wall and building the basic ground infrastructure in preparation for the upcoming main "nuclear park", the official informed. India seems to be optimistic that Macron's visit could be a clincher and the set the ball rolling once again on the long-pending and costly JNPP proposal, now pegged at Rs 1.12 trillion ($17 billion). But activists and experts say they will continue to oppose the project. "Our opposition to the project continues as it will harm the fragile ecosystem of the Western Ghats and Maharashtra coasts, deprive thousands of farmers and fisherfolk of their livelihood, besides other risks and safety factors," said prominent activist Minakshi Patil, spearheading one of the several groups in the anti-JNPP campaign. Besides, she pointed out, after the Fukushima Daiichi disaster, the world is veering towards other renewable energy options which are much cheaper, clean and totally risk-free. So why should India insist on going ahead with JNPP, she asked? Environmental activist and lawyer Asim Sarode of Pune alleged that without doing a cost-benefit analysis of such a huge project, it is best for India to walk out since the delays indicate the government wants the costs to escalate, thereby, increasing the scope of corruption. "Maharashtra is already surplus in power; plus we have enough sunlight most part of the year. Why can't they exploit cheap solar, wind or other renewables instead of investing in a mega-project that is doomed to go like the Bullet Train," Sarode told IANS. Other activists and experts have already warned against going ahead with any deals with bankrupt MNCs attempting to "dump" obsolete yet expensive technologies for their financial benefit at the cost of the Indian people -- without considering the effects of radiation on humans, animals and marine life, the local environment and the Arabian Sea waters on the west coast. It has been reported that the EPR technology that is being offered for JNPP is not commercially operational anywhere globally. There are five under-construction projects using this technology - and all of them are facing time and cost over-runs.